In this beautifully illustrated guide, artist and shamanic teacher Evelyn C. Rysdyk shows you how to create, decorate, consecrate, and use various sacred tools in ritual and healing. Navaho traditional healers bring rattles, corn pollen, eagle feathers, and sage smoke together with songs and dances to affect healing. Ulchi shamans use drums, rattles, and larch tree wands called gimsacha to work healing magic. Manchu shamans will perfume the air with incense and tie on a heavy bustle of iron jingles as a part of their ceremonial costume. Modern shamanic practitioners likewise use sacred tools to facilitate our connection to helper spirits in the Upper, Middle and Lower Worlds, as well as the spirits of nature. While you can purchase many of these tools, there�s nothing quite as powerful as making your own. 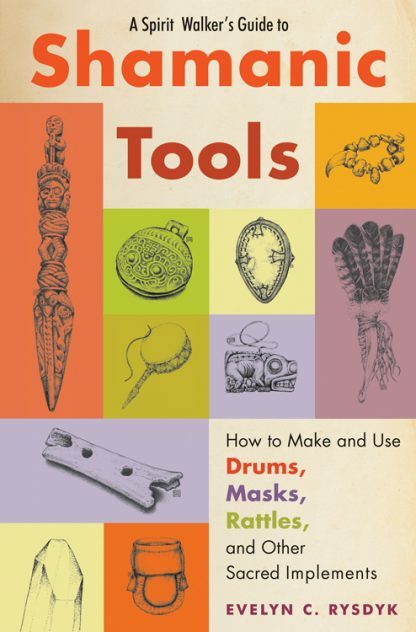 You�ll find instructions for making rattles, drums, masks, mirrors, spirit figures, fans, bells, pouches, wands, prayer bundles, flutes, whistles, and more. Plus suggestions for responsible ways to obtain the materials you�ll need. The author�s original artwork and photographs of shamans and their authentic tools appear throughout the book. Evelyn C. Rysdyk is a shamanic practitioner and teacher. She has studied with Michael Harner and Sandra Ingerman and is a graduate of the Foundation for Shamanic Studies Three-Year Program in Advanced Shamanism and Shamanic Healing. Since that time, she has worked with indigenous shamans from Siberia, Peru, Central Asia and Nepal. Evelyn helped found True North, an integrated medical center in Falmouth, Maine, where she works alongside medical practitioners to bring physical, spiritual, emotional, and spiritual healing to patients. She lives in Maine.